I’ve been stuck in a bit of a breakfast rut lately. Toast everyday. So I decided I needed to do something different. It definitely needed to be warm as the weather has been so COLD. I’ve had a hankering for an omelette for breakfast for the last couple of weeks, so I thought I’d try to make one using chick pea flour. 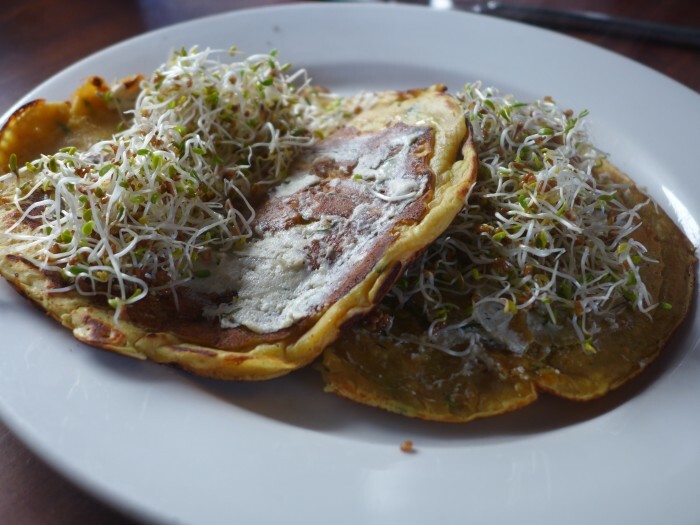 There are a lot of omelette/pancake-like creations made from chickpeas, ranging from the French socca to various Indian pancakes. This recipe owes more to the Indian side rather than the French, though the raising agent and spicing are completely different. Even though I added a little baking powder to the mix, these ended up more like a substantial pancake than an omelette, but the flavourings were good. I restricted my additions to the pancake to some parsley, black salt (which gives an eggy flavour) and turmeric for colour, but you could use any flavourings you like really. 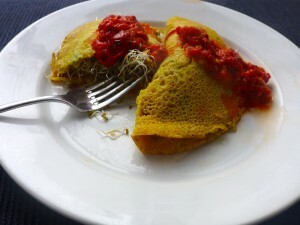 I stuffed the finished omelette with sprouts and vegan cheese and served it with some capsicum relish. The second day I added a little truffle oil to the mix, and filled them with some cashew cream cheese and sprouts, also delicious. They definitely hit the spot even if they are not quite like an omelette! But I’ll keep experimenting. I think silken tofu might be featuring in the next one. Add some oil to a pan and fry the onions until softened and they have a bit of colour. Add the onions to a bowl and mix all the other ingredients in. Spray the pan lightly with oil. Pour ¼ of the mix into the pan and cook until the edges of the omelette dry out. Shake the pan to loosen and flip. Serve folded with your favourite savoury filling. These can be made with any flavourings you like. Yum! I do like a chickpea flour-based egg replacer. I’m quite loyal to the omelette recipe in Vegan Brunch, which includes silken tofu and a bit of nooch along with the chickpea flour and black salt. Chickpea flour is surprisingly good for French toast too! This wasn’t the perfect omelette, closer to an eggy pancake, so I’m still searching. I did think it would be better with some silken tofu. Will have to give the Vegan Brunch one a go.